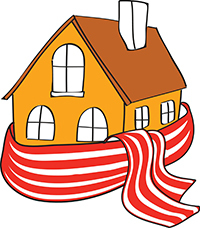 Better insulation materials are a money and energy saver for all. A new collaborative project is set to address the need, and involves ROCKWOOL International A/S, a major producer of insulation materials, and the University of Copenhagen’s Nano-Science Center. The partners will study insulation materials at the atomic level and devise solutions for a major climate challenge. The project is supported by the Danish National Advanced Technology Foundation. A great deal of global energy usage stems from maintaining warmth in buildings when it is cold outside, and keeping them cool when it’s hot. Our ability to insulate buildings and develop better insulation materials is an important part of reducing global energy use. Insulation materials produced by ROCKWOOL International A/S are made of mineral wool and used to insulate buildings and industrial facilities around the world. Eventually, these materials break down. In our part of the world, buildings are designed to have a lifespan of 50, 100 or more years. Accordingly, building materials are often thicker, heavier and more resource intensive than necessary to extend the life of structures. In a new collaborative project between the University of Copenhagen’s Nano-Science Centerand ROCKWOOL International A/S, researchers will conduct an in-depth investigation of this resource and energy challenge. - We know that heat and humidity influence the breakdown of insulation materials, but we don’t know why. Using nanotechnology, we will look at and measure the fibres and glues found in these materials at the atomic level. The new data will be an important contribution to the improvement and development of new insulation products, according to Denis Okhrimenko of the University of Copenhagen, an industrial postdoc who, together with the Department of Chemistry’s Klaus Bechgaard, will work on the project in the coming years. The demand for sustainable building materials is on the rise around the world and satisfying this demand can reduce energy use, which is a major reason for ROCKWOOL’s involvement. - ROCKWOOL International A/S doesn’t just want to improve insulation materials in the construction industry. We want to develop insulation materials that are adopted in everyday building. We believe that nanotechnology can be a key to developing stable and sustainable insulation materials, and have therefore entered into this venture with the Nano-Science Center, says Dorthe Lybye, Programme Manager at ROCKWOOL International A/S. The development of new materials and understanding of what is happening when insulation materials are subjected to heat and humidity requires that researchers have a thorough understanding of the properties and composition of insulation materials. The knowledge will be accumulated and investigated by the NanoGeoScience group at UCPH’s Department of Chemistry. The group consists of researchers who are skilled with nanotech instruments; chemists who are knowledgeable about the glue in materials; geologists, who know about the mineral wool; and physicists, who understand the relationships between these materials. - We are pleased that the group will contribute to the solution of some of the energy-related challenges that society faces, says Professor Susan Stipp, head of the NanoGeoScience group at the Nano-Science Center. The project is supported by the Danish National Advanced Technology Foundation. Industrial Postdoc Denis Ohkrimenko is to study insulation materials at the atomic level with ROCKWOOL International A/S. The researchers will develop new and improved insulation materials, in order to reduce global energy use.